Increased thickness - 15 times stronger than 1/4 inch thick glass. Easy install™. Precise fit™. Best on the Market !! TV-ProtectorTM is a crystal clear shield with advanced technology Anti-Glare efficiency that attaches to a flat-screen TV and protects the fragile screen from damage. Stop warring and start enjoying your TV! Highest quality optical-grade acrylic plastic is as clear as glass and maintains the sharp and vivid picture of any HDTV. The Antiglare TV screen protector is used by Families with Children, Nintendo Wii owners, pet owners, Hotels and other institutions. Provides protection when the TV is positioned horizontally or vertically on a stand or mounted on a wall or ceiling. 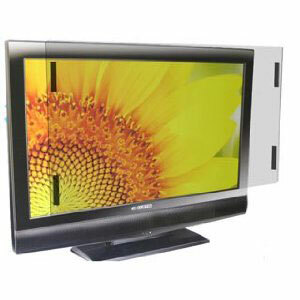 Scratch resistant; Reduces the UV radiation emitted from the TV screen. Stylish design that makes the TV screen protector unnoticeable and keeps the gorgeous look of any flat-screen TV. NO Ugly Straps, clamps or buckles! Sized for YOUR TV - NOT one that "fits" several sizes. Designed to absorb substantial impact. The protector can be broken only by very heavy object e.g. brick or hammer. Remove the protective film on both sides for an easy stick on Installation that takes a few minutes and does not require special tools or skill. Attachment strips connect to the TV frame (bezel). The strips are equipped with releasable pull-tabs that allow the non-glare protector to be permanently removed (when the kids grow older) without leaving a trace. Guaranteed!!! Once installed reclosable pads allow the screen protector to be temporarily detached for cleaning. The pads hold strongly making it virtually impossible for children under the age of 3 to interfere with the protector. Designed to allow for 1/4 inch gap between the screen and the protector maintaining constant ventilation that prevents screen overheating. TV-ProtectorTM is designed to cover the screen of your TV and will extend approximately 1 1/4 inch around the screen. Proprietary product of superior quality ensures enhanced protection for a flat-screen TV. TV-ProtectorTM is a leading brand of TV screen protection equipment in the US.